Nigeria’s budget for 2016 has not had an easy ride since it was first proposed, amid great fanfare, by President Muhammadu Buhari in December 2015. The West African giant is facing a number of economic challenges, including a slump in global oil prices and calls for its currency—the Nigerian naira—to be devalued to deal with falling foreign exchange revenues. Buhari was elected partly on an anti-corruption ticket and has made tackling graft a key priority of his administration, with a number of high-profile arrests taking place during his tenure. Yet two months into 2016, Nigeria is yet to approve its fiscal plan for the year and the budget issue risks undermining the president’s battle against corruption. Newsweek looks at how the budget went from a symbol of change to a laughing stock in five steps. In December 2015, President Buhari announced his first budget since he was elected in March that year. And it was ambitious. Buhari declared that a record 6.1 trillion naira ($30.6 billion) would be spent on the economy and infrastructure in 2016, a 20 percent increase on the previous year. Buhari said Nigeria’s deficit was expected to double to 2.2 trillion naira ($11 billion), but that this would be covered by raising 900 billion naira ($4.5 billion) in overseas funding on top of 984 billion naira ($4.9 billion) borrowed domestically. The president’s budget also predicted that of expected revenues of 3.9 trillion naira ($19.6 billion), just 820 billion naira ($4.1 billion) would come from oil, despite petroleum exports constitutingalmost 92 percent of the total value of Nigerian exports. 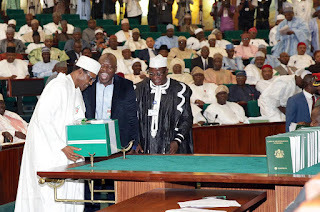 In a break with tradition, Buhari proudly delivered his budget to the National Assembly in December 22: the task was usually left to the finance minister under the previous administration of Goodluck Jonathan. Step 2: O Budget, Where Art Thou? The first chinks in the shining armor of the budget began to show in early January, when hundreds of hard copies of the document went missing from the Nigerian Senate, the upper house of the National Assembly. As well as causing national embarrassment, the unfortunate incident led to the Senate accusing one of Buhari’s aides of quietly withdrawing the budget in order to iron out discrepancies, with senators refusing to debate the budget until it was presented in its original, undoctored form. 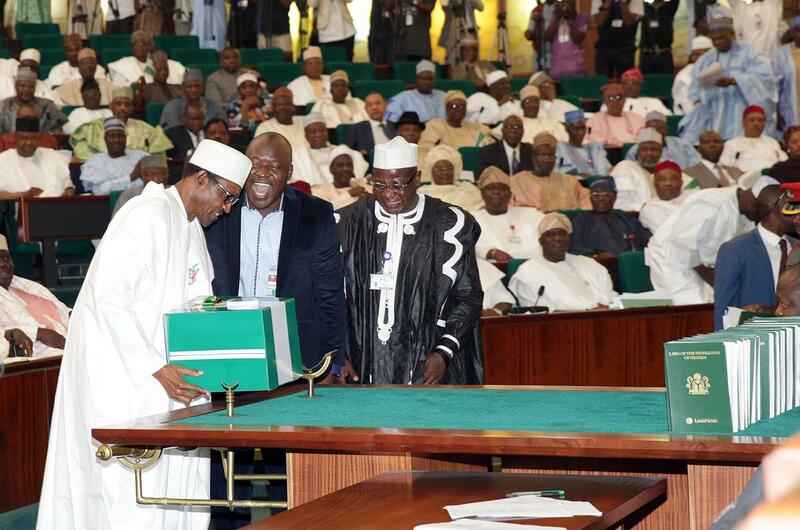 The issue of the missing copies fell by the wayside when Buhari sent amendments to the budget on January 19, but the fiasco had hinted at more mayhem and mischief to come. Following the sideshow of copies going missing, the budget really began to unravel in early February. An analysis by Nigerian news site Premium Times found a number of dubious allocations: these included a 3.8 billion naira ($19 million) allocation for the State House Medical Center, which treats just a few patients including the president and his family, while just 2.7 billion naira ($13.6 million) was allocated for the constructions of hospitals across the 180 million-strong country. Furthermore, almost 5 billion naira ($25 million) was allocated for the office of Vice President Yemi Osinbajo to spend on books—more than many of Nigeria’s state universities—while 22 billion naira ($111 million) was set aside to pay rent at the State House, occupied by Buhari, with spectators baffled about who the rent was going to. Now the fiasco was really getting into full swing. Nigerian Health Minister Isaac Adewole, speaking to the Senate Committee on Health on February 8, disowned his ministry from the controversial budget proposals. “This was not what we submitted. We’ll submit another one. We don’t want anything foreign to creep into that budget,” said Adewole. All this talk of rats and a “budget mafia” of anonymous civil servants padding the financial plan has severely delayed the budget’s implementation. On February 9, the National Assembly postponed a vote on the budget from February 25 to an unspecified date in the future, with those in charge of the budget citing the need for more time to prepare a final and, hopefully, foolproof edition. With two months of wrangling over the budget, it was perhaps inevitable that heads would roll. The Nigerian presidency announced on February 15 that Yahaya Gusau, the director general of Nigeria’s budget office, would be replaced with immediate effect by former banker Tijjani Abdullahi. No reason was given for Gusau’s abrupt departure, but it is hard to believe it is not linked to the comedic turn of events that have occurred over the past few months. Buhari admitted on Tuesday that the saga had been “embarrassing and disappointing” and that those responsible for padding the budget would not be allowed to go unpunished. It remains to be seen, however, whether the president and his government’s anti-corruption pledge can recover from this damaging turn of events.